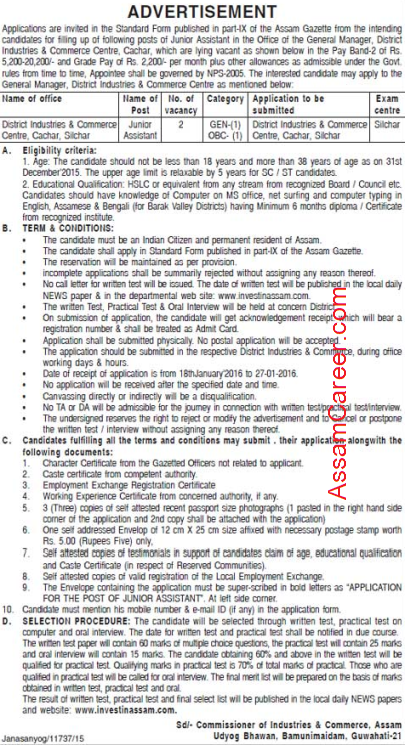 O/o Commissioner Industries & Commerce, Assam. Applications are invited in the Standard Form from intending candidates for filling up following vacant posts in the office of the General Manager, District Industries & Commerce Centre, Cachar. Pay : PB-2, Rs.5200 – 20,200/- + GP of Rs.2200/- PM + other allowances. Educational Qualification: HSLC Passed and candidates should have knowledge of Computer on MS Office, net surfing and Computer typing in English, Assamese & Bengali (for Barak Valley Districts) having minimum 6 months diploma/ certificate from recognized institute.